Buddy and The Star Babies is such a fun and whimsical juvenile cotton print fabric. 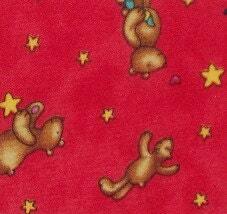 A red background with plump brown bears reaching for the stars. Create a bright quilt for a baby gift and everyone will fall in love with Buddy and The Star Babies. All fabric from The Quilted Nursery Children's Fabric Store is cut directly from the bolt in continuous yardage unless otherwise specified. We now offer fractional yardage cuts for your shopping convenience. All shipping overages are refunded on shipment of fabric. Same day shipping always!